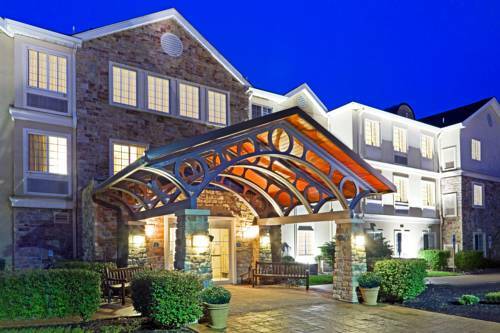 Come Home to Hotel's Suites in Cranbury, NJWhether you're looking for extended stay accommodations in the Princeton area or seeking hotels on the NJ Turnpike for an overnight stay, the Staybridge Suites Hotel Cranbury - South Brunswick offers a welcome home away from home. Situated near Route-1, -130 and -535, this hotel affords area travelers convenient access to South Brunswick, East Brunswick, Monroe, Jamesburg and Princeton.Those traveling for business appreciate this hotel's services. While in Cranbury, NJ, business guests find it easy to keep up with the office thanks to free hotel-wide, wired and wireless HSIA and a Business Center. The hotel's location on the NJ Turnpike also ensures an easy commute to such area companies as Canon, Rhodia, Williams-Sonoma Distribution, Home Depot, CNA Insurance and Barnes & Noble Distribution.Those visiting Cranbury for leisure love being near the Princeton area. This hotel's location puts Princeton University and the community's many attractions within a short drive. Hotel patrons are also within minutes of local theme parks, including Six Flags Great Adventure & Wild Safari and Sesame Place.Fantastic amenities await guests of this pet-friendly hotel. A free breakfast buffet helps to jump start each day, and the evening Sundowner Receptions provide a social outlet. Kids love the outdoor pool and sport court, and the Fitness Center keeps adults active, too. Prepare to "Get Comfortable!" Children's program - Children's board games are available at the front desk.